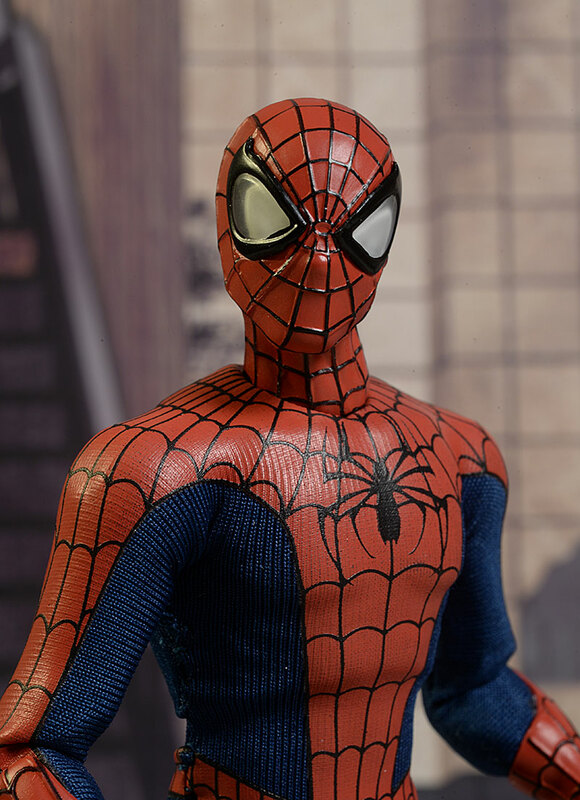 Spider-Man, Spider-Man, does whatever a spider can...and it seems like Mezco is doing whatever they can, and doing it so, so well right now. 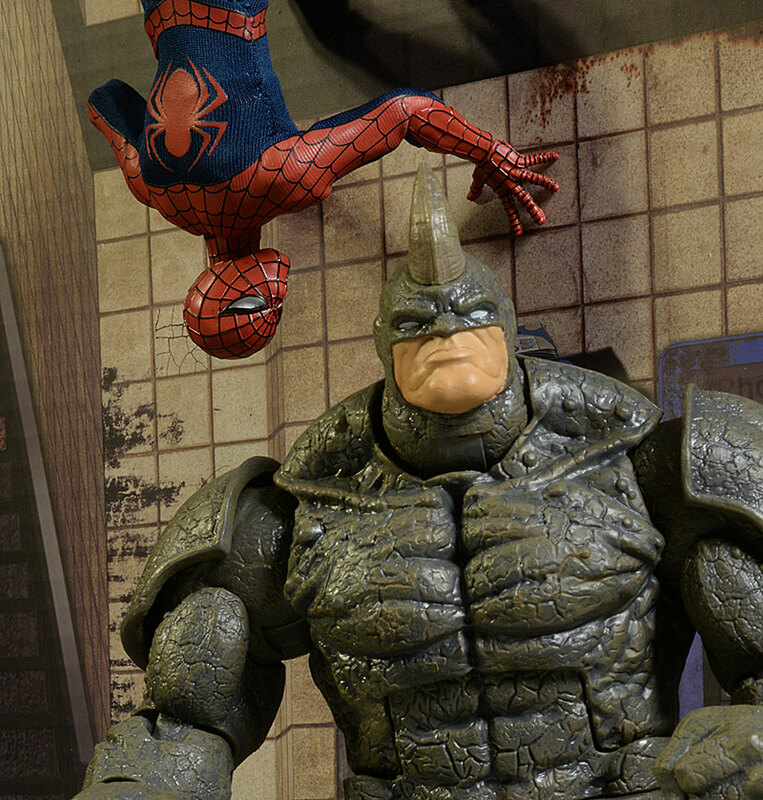 Their showing at Toy Fair is pleasing many collectors, and there's a whole bunch I need to pre-order. This regular version retails for around $80 at most places, and just started shipping in the last week or so. The package is heavy duty stuff, well made and capable of handling shelf wear and long term storage. Of course, they want you to open it up and play with this guy, so they include a little plastic baggy to hold all the accessories if you do decide to toss the cardboard. The package is collector friendly too, so if you want to keep it, you won't need to cause any damage when you remove the figure and accessories. This guy comes with two portraits: one has the more modern wide eyed look; the other has narrower eyes, which seems a bit more old school to me. 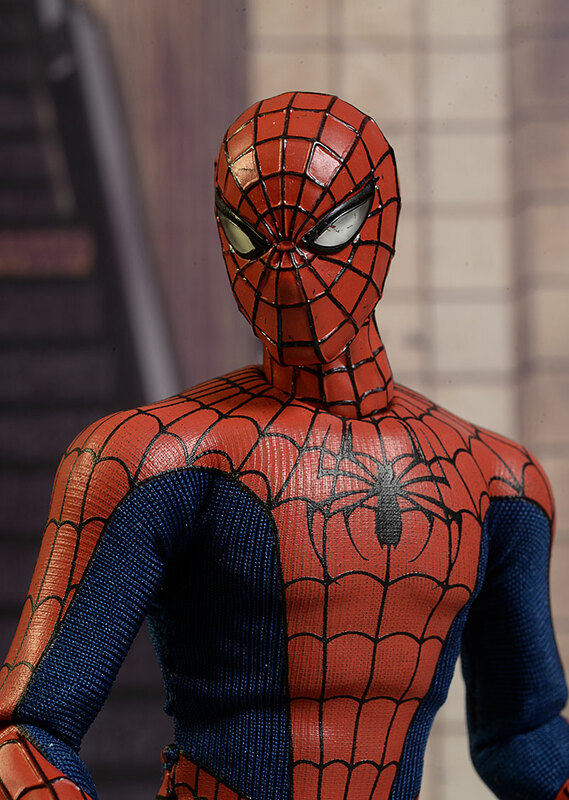 Both look terrific, with nice detailing on the sculpted web pattern, and I really like the acrylic eye coverings. The scale is good too, and not just the heads, but the size and shape of the body as well. There's a variety of hands designed to work with the accessories, and the sculpts are all good. They swap easily, and stay in place when posing. They do tend to pop off easily when the webs are in place, but more on that in the Accessory section. 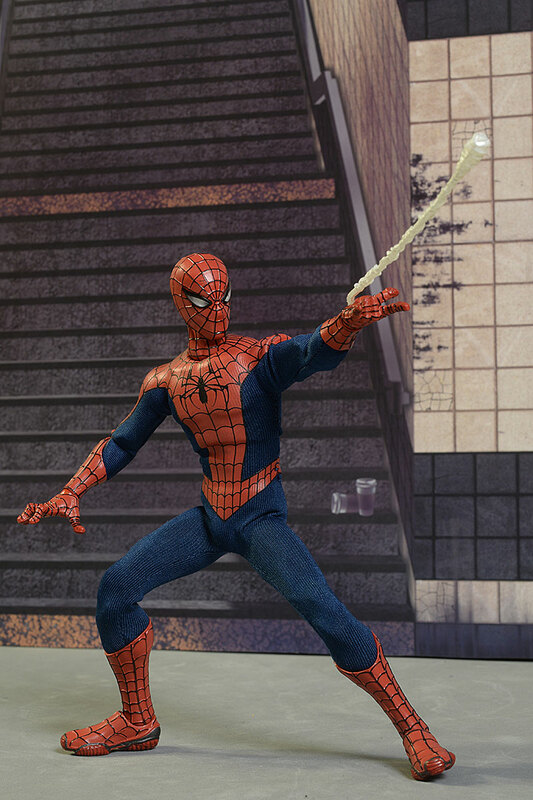 Remember, these are 1/12 scale, and Spidey comes in at about 6 3/8". Other sculpted suit details, like the gloves and boots, blend in with the cloth pieces of the costume. One other thing worth mentioning is the appearance of the shoulders in the tight suit. With certain bodies, these have looked too ball-like and round. That's not an issue here, and I'm not sure if it's only the slim body or if they've made a correction to the larger bodies moving forward as well. 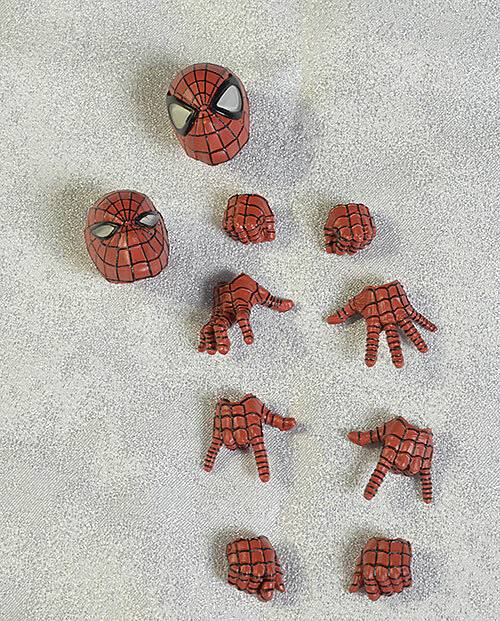 The most important aspect of the paint work on Spidey is the webbing of course. The painted areas are super clean, and as with the sculpt, the painted lines blend in smoothly with the printed lines on the cloth sections. One area where my figure took a hit was the white eyes themselves. Both have some issues, but the squinted version has some scratches on the interior that are pretty obvious. Hopefully this is a one off problem, and you won't see the same thing with yours. This is the slim body, and it works great. The neck is jointed at both the jawline and the torso, and you can get tilt, lean, and turn movement in both areas. A great neck like this goes a long way to creating realistic poses. The shoulders, biceps, elbows, and wrists work great together, and the suit doesn't create any undue restriction. 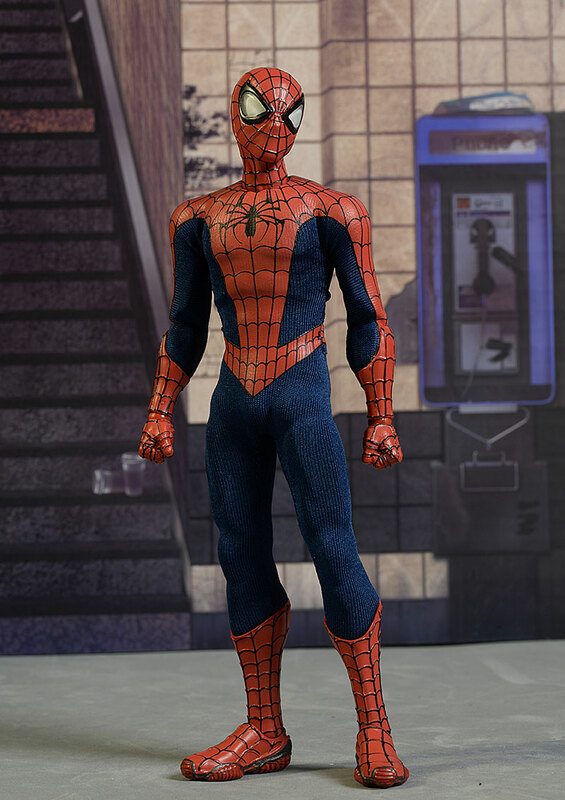 The torso bends and turns at the chest and waist, and the joints are tight enough to maintain poses, even with the suit pushing back on it. The hips, knees, and ankles are every bit as good as the arms, and the ankles have plenty of rocker movement. 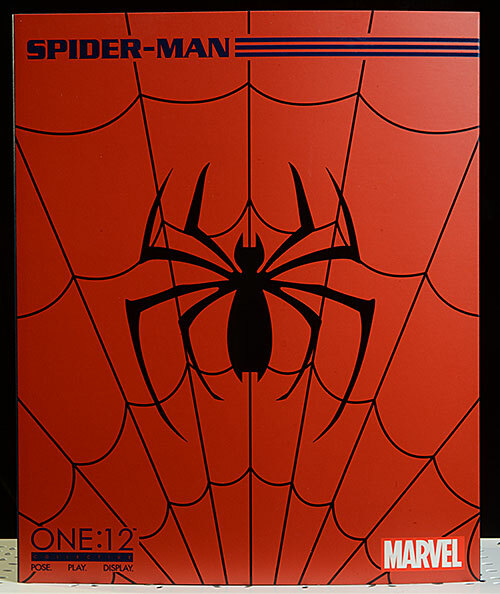 The One:12 figures tend to vary at this joint, with some, like Spidey, working great, but others more restricted. With a character like this, it's a critical joint, and I'm glad the mobility is there. He's well outfitted, even if we have seen these accessories with another Spider-Man. Of course, if you didn't buy the others, it's all new and unique to you. The portraits are unique - I think. They look new to me, especially the squinted expression. The heads swap easily, and I can see good reasons to use both. There are a bunch of hands too, four sets in total. He comes wearing fists, and there's a tight grip set, a web shooting set, and a wall crawling set. 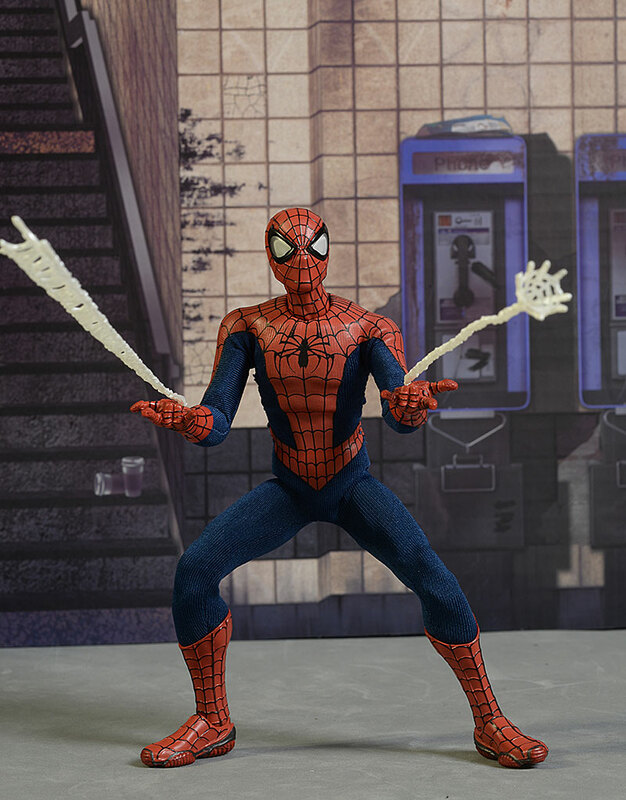 They swap easily as well, but when you put the webs in place around the wrist pegs, it doesn't leave a lot of room for the hands. 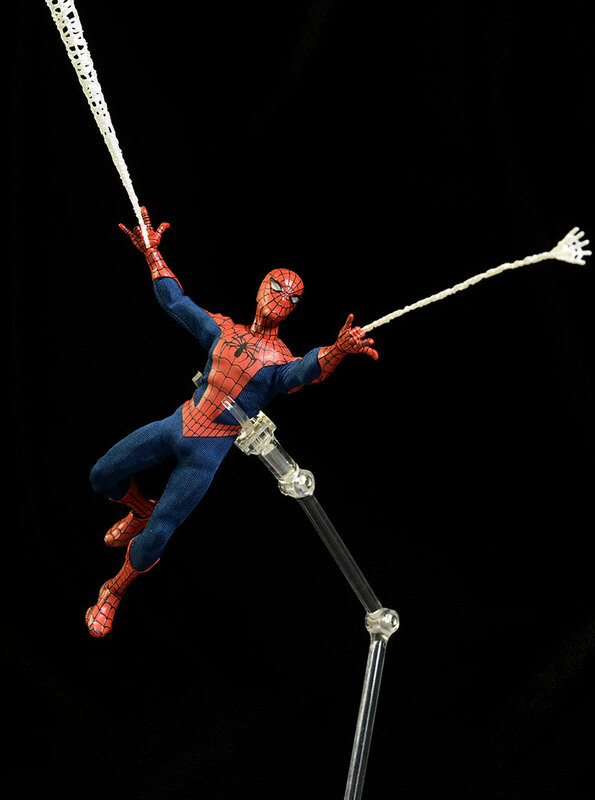 It works, but the hands tend to pop off pretty easily when the webs are in place. 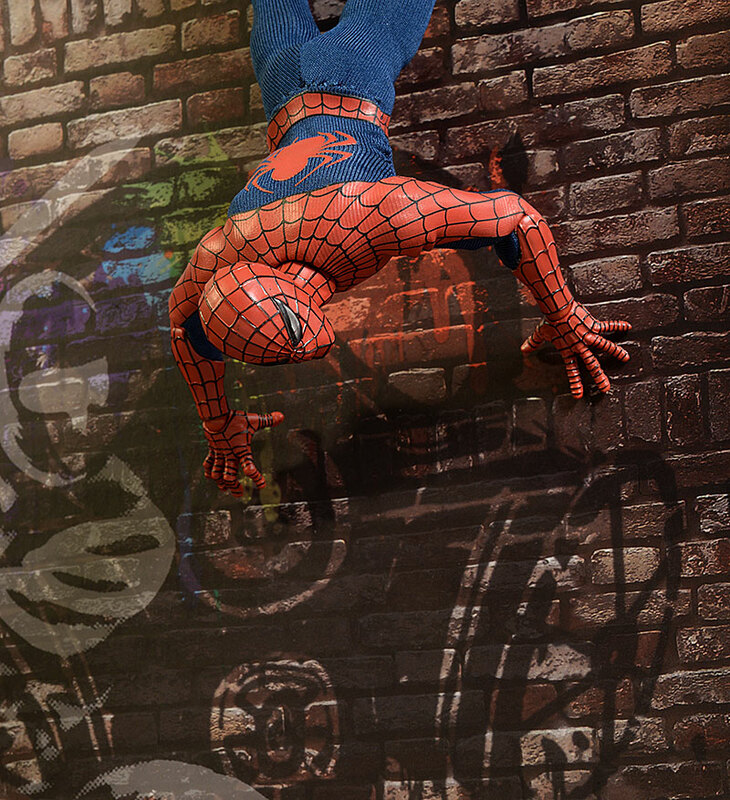 Speaking of the webs, there are five different ones. 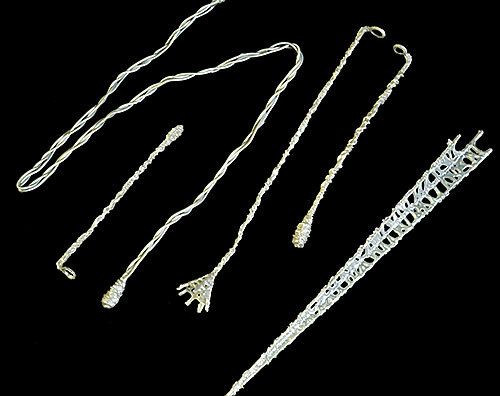 There's one long, bendy wire version that you can wrap around him or other items, and he can actually hang from. The other four are varying sizes and shapes, and each has a small loop at one end. This loop fits over the wrist peg, and when the web shooting hand is in place, it appears as though these are 'shooting' from his wrists. It's not a great effect, and it works better in theory than in practice, but they get points for trying something unique. Finally, there's the display stand. There's a small foot peg, or you can use the larger translucent waist grabber, which works great for jumping and leaping poses. I've heard about costume problems from other collectors in the past, but I've never had any issues...til now. The costume looks terrific. It's an excellent design, and there's enough plastic with the cloth to create visual interest. But this time I have some seam issues. The seam along his waist is wonky, and there's a bulge in the seam along both sides, under his arms. None of these areas are open or torn, but they do look weird. Again, like the eye issues, I'm hopeful that this is a one off problem, and not something we'll see commonly across the series. Great articulation, great accessories, and lots of posing potential - that's about all you can ask for in this category. You'll spend a ton of time posing and re-posing him, and he's going to look great with the other figures in the collection. It looks like $80 is the new normal. Thankfully, we're still getting a buttload of accessories including the second portrait, so I can live with an average score here for the time being. Be very careful with the tiny round loops on the webs. The fit of the hand over them onto the wrist post is tight, and you don't want to put too much pressure on the white plastic. I'm really happy overall with the One:12 line. I haven't had the quality issues I've heard some folks complain about, but perhaps I've been lucky - this is the first time I've had any problems at all, and while my issues with Spidey are still minor (without macro photos, you'd have a hard time seeing them), I was a little surprised based on my past experiences. 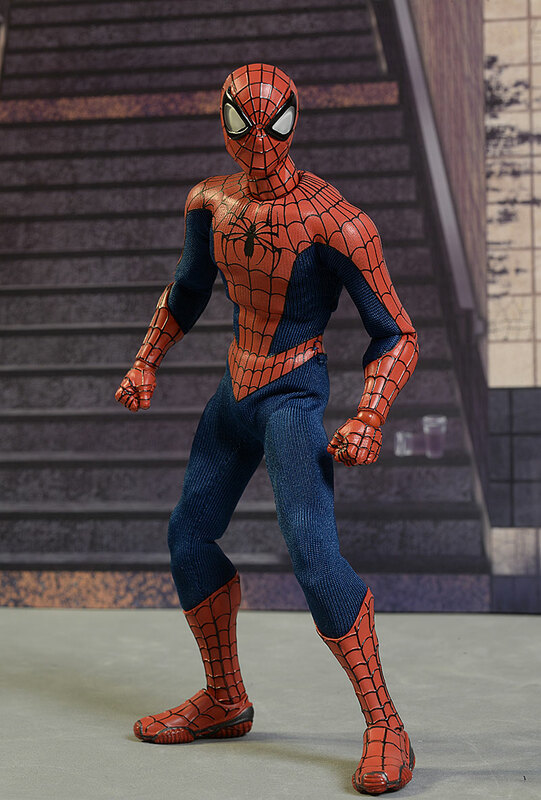 This was the Spider-Man I was really looking forward to, but I'm also really geeked about the lighter blue Homecoming release, not to mention the homemade costume version. When I finally get back to doing my Top Ten lists, I'll be doing one for Spider-Man action figures, and I can guarantee one of these guys is going to end up very, very high on that list. - has him for $80. - also has him for $80. - has him at $86. - Entertainment Earth had him at $80, but it looks like they are pre-sold out. If you have a future One:12 purchase planned, they're a good choicew because they have free shipping. I've covered a ton of One:12 figures, with the most recent being the PX Exclusive Deadpool. The only other Spider-Man so far is the Morales version, but I'll be covering the others as they come out. I just covered the Mezco exclusive Deadpool a couple weeks ago, and don't forget the One:12 X-Men Deadpool that was a 'summer' exclusive, as well as the recent Deathstroke, Suicide Squad Harley, the regular Red Skull, classic Superman, the Morales Spider-Man. I've also covered the the exceptional classic Punisher, the regular release Punisher the Toy Fair exclusive version, Shazam, the classic Daredevil, the Flash and Reverse Flash, the BvS Superman, the comic based Joker, Green Arrow, the Frankenstein Monster Diorama, Frankenstein Monster, the BvS Batman, the Bvs Armored Batman, Captain America, Star Trek Kirk, the Mirror, Mirror and Cage variants of Spock, Sulu, the Toy Fair exclusive Spock, and the regular release Spock as well. Other One:12 Collective figures released so far include Dredd and his Lawmaster, the NYCC exclusive Judge Dredd, the DKR Batman and Mutant two pack, the Batman exclusives, and the initial DKR Batman.